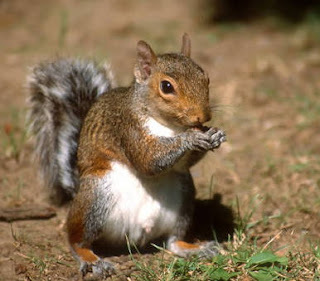 A medium-sized squirrel with upperparts dark yellowish rusty, especially on head and back; legs, arms, sides of neck, and sides of rump with gray-tipped or white-tipped hairs, giving a gray tone to these parts; hairs of tail dull yellow at base, then blackish, and tipped with white; underparts white; ears with conspicuous white spot at base in winter. External measurements average: total length, 460 mm; tail, 210 mm; hind foot, 61 mm. Weight of adults, 321-590 g.
Distribution in Texas. Native distribution includes eastern one-third of state. Introduced at locations to the west of its native range. 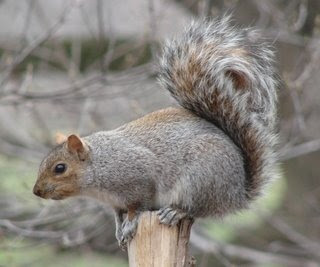 In Texas, gray squirrels live mainly in dense hammocks of live oak and water oak and in the deep swamps of cypress, black gum, and magnolia that border the streams. Phil Goodrum found that they were most abundant in hammocks where the principal vegetation was white oak and water oak mixed with magnolia, linden, sweet gum, and holly. Poorly drained bottom lands with their pin, evergreen and overcup oaks, elms, bitter pecan, black gum, cypress, and ash support much smaller populations. In well-drained bottom lands with post and red oaks, hackberries, gum elastic, and pecan, the populations are still smaller, and upland forests usually are devoid of gray squirrels. They den in hollow trees when available, but they also utilize outside leaf nests, especially in spring and summer. These serve usually as refuge, resting and feeding stations and occasionally as nurseries. Placed in trees, they are constructed of twigs, leaves, and so forth on the outside and lined with shredded bark, plant fibers, and grasses. Usually there are two openings. 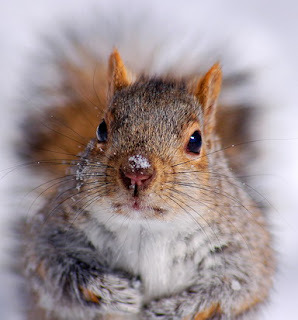 Gray squirrels feed on a variety of foods, chiefly plant in origin. Goodrum lists buds and mast of oak and pecan trees, grapes, fungi, red haw buds, sedges, grasses, mulberry, larval and adult insects, and amphibians. Their mainstay, however, is mast (acorns, etc.). 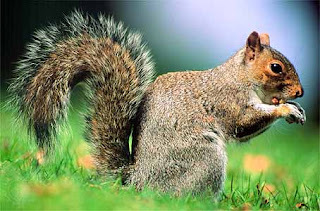 They begin eating acorns in the Spring and continue throughout the year if they are available. When mast crops fail in one area, the squirrels usually move en masse to other areas where food is more abundant. 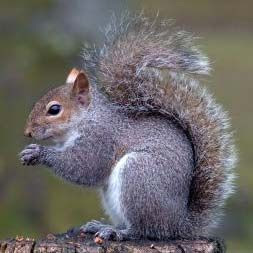 This accounts in large measure for the "migrations" of squirrels that are frequently reported. Normally they feed twice a day — early morning and late afternoon — and are less active at midday. These squirrels breed throughout the year, but there are two rather distinct peaks — July, August, and September and again in December, January, and February. Mating is more or less promiscuous; several males usually attempt to mate with each receptive female. After a gestation period of 40-45 days, the two to four naked, blind, and helpless young are born. They remain in the nest for about 6 weeks by which time their eyes are open and their teeth have developed so they can eat solid foods. By that time they weigh about 200 g. They remain in family groups for a month or so after they begin foraging for themselves. When 6 months old they are nearly adult in size and have left the home territory. They mature sexually in their first year and produce young of their own when about 12 months old. These squirrels are highly prized as game. In most parts of their range they are decreasing in numbers because of overhunting and the removal of favored habitat by drainage or lumbering operations. Consequently, sound management of their habitat is becoming an increasingly important responsibility. Their future will depend upon the acreage remaining in hardwood forests, the length of timber rotations, the species composition of hardwood stands, and the abundance of mast supplies and dens. They do some damage in pecan orchards, but such depredations are local in nature and can usually be minimized by placing tin shields around the trunks which prevent the squirrels from climbing trees. Que carita tiene , parece que nunca haya roto un plato .